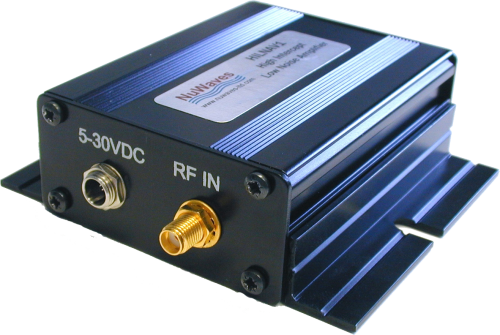 This high-performance module delivers 20 dB of gain across the frequency range of 50 MHz to 1000 MHz with an OIP3 of +32 dBm and less than 1 dB of noise figure. NuWaves’ HILNA V1™ is the first in its class of broadband low noise amplifiers designed to achieve high gain while maintaining low noise and a high third-order intercept point from VHF to microwave frequencies. HILNA V1’s robust power supply also operates over a very broad range, easily allowing the unit to be integrated into systems without regard to power supply precision. To order with mounting flanges, please request P/N: HILNA-V1-M/F.